The death of CIA operative Theodore G. "Ted" Shackley in December 2002 triggered an avalanche of obituaries from all over the world, some of them condemnatory. Pundits used such expressions as "heroin trafficking," "training terrorists," "attempts to assassinate Castro," and "Mob connections. The death of CIA operative Theodore G. "Ted" Shackley in December 2002 triggered an avalanche of obituaries from all over the world, some of them condemnatory. Pundits used such expressions as "heroin trafficking," "training terrorists," "attempts to assassinate Castro," and "Mob connections." More specifically, they charged him with having played a major role in the Chilean military coup of 1973. But who was the real Ted Shackley? 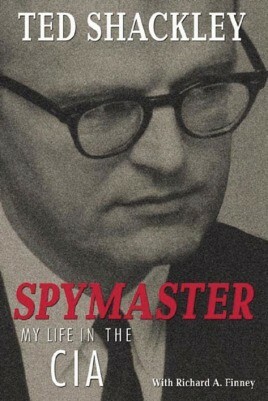 In Spymaster, he has told the story of his entire remarkable career for the first time. With the assistance of fellow former CIA officer Richard A. Finney, he discusses the consequential posts he held in Berlin, Miami, Laos, Vietnam, and Washington, where he was intimately involved in some of the key intelligence operations of the Cold War. During his long career, Shackley ran part of the inter-agency program to overthrow Castro, was chief of station in Vientiane during the CIA's"secret war" against North Vietnam and the Pathet Lao, and was chief of station in Saigon. After his retirement, he remained a controversial figure. In the early eighties, he was falsely charged with complicity in the Iran-Contra scandal. Ted Shackley's comments on CIA operations in Europe, Cuba, Chile, and Southeast Asia and on the life of a high-stakes spymaster will be the subject of intense scrutiny by all concerned with the fields of intelligence, foreign policy, and postwar U.S. history.